1. Flip the circuit breaker to cut off the power. Most microwave/oven combo units are wired directly into your home’s power. Because you need to access the internal parts and disconnect the wiring, completely shut off the power first through the circuit breaker. Pull the unit out and disconnect the wiring so you can access the whole appliance. Next, remove the trim on the sides of the machine if it has any. Open the oven door and remove the screws in each front bottom corner that hold the trim in place. Pull the bottom of the trim free at an angle and slide it out of the groove at the top of the appliance. Repeat for both the left and right side. After that, pull the oven out of the combination cabinet. To do this, remove the screws along the perimeter of the oven. Then carefully wiggle the appliance out a few inches and pull it the rest of the way out. Then go to the rear of the machine and remove all the screws holding the lower access panel in place. Set the lower access panel to the side. Also remove the panel above it. To do this, you’ll need to loosen the screws holding the left and right lip in place on either side of the appliance, as well as three screws securing the panel to the back. Now you should be able to see the lower blower assembly in the middle of the revealed interior space. 3. Replace the lower blower assembly. There are four screws holding the blower in place: one at the bottom of the right end, two at the bottom of the left end, and one partially behind the left end. Remove all four screws. Also disconnect the wire harness on the right side of the blower assembly. Then you can lift the part up out of the machine and set it aside. Carefully peel the insulation away from the old blower and unscrew the duct. Transfer these parts over to the new part. 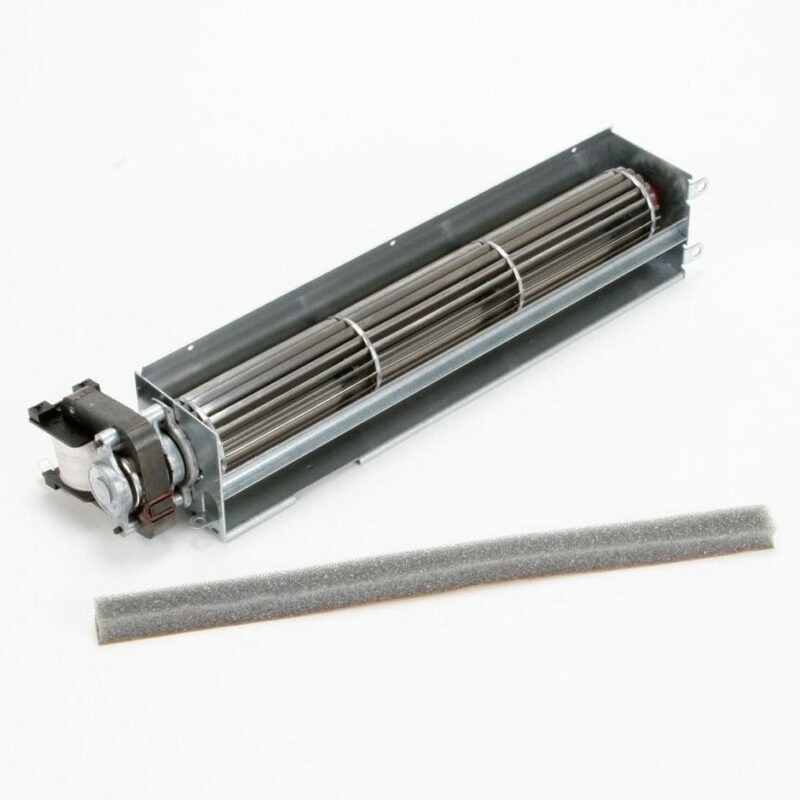 Make sure the insulation lays flat and adheres to the bottom of the blower assembly. To install the new part, work backward. First, orient the new lower blower assembly so the holes for the two screws are on the left and the port for the wire harness is on the right. Place it on the brackets and align the screw holes. Once it’s in place, reconnect the wire harness; either wire can attach to either terminal. Then rethread all four screws into place. 4. Reassemble the oven/microwave combination unit. Start by reattaching the upper access panel to the rear of the oven. Hold it in place as you add back the three screws to the back of the panel. Then retighten the screws holding the edges in place on the left and right side of the oven. Next, reattach the lower access panel. Just like before, hold it in place and align the wholes as you start reinserting and tightening the screws. After that, slide the oven unit into the combination frame. You may want to have a second person help lift the back edge as you push it into place. Resecure the oven to the frame with the two screws you removed earlier. If your microwave/oven combo had trim, slide the top edge of each piece into the groove next to the microwave. Then push the pieces flush against the side of the appliance. Open the oven door and replace the screws in the bottom front corners to secure the trim. Once you return the combo unit to its place and reconnect the wiring, flip the circuit breaker to turn the power back on. For more appliance repair guides and tips, go to Appliance Tec here.